This is a good basic skirt/tutu technique that's been flying around Pinterest for awhile. 4. Keep doing this until your skirt is full! (6th image) You can add bits of rags, ribbon, or anything else you like, for different textures and effects. Wear it with a black top, grab a broom and your good to go! 5. You can take, yet another, bin bag and cut the closed bottom off so you have a tube. Step into the tube, and pull it up to your waists, pull the excess bag to the side and tie it roughly in a knot. This can be used as a lining for the tutu skirt. 6. Also, if you make the tube again out of another bag, and cut down the seam this time to create a large rectangle, this can be tied loosely around the neck to create a cape! 7. You can make other witchy accessories out of card like the hat, or roll up brown parcel paper with brown parcel tape to make a wand. 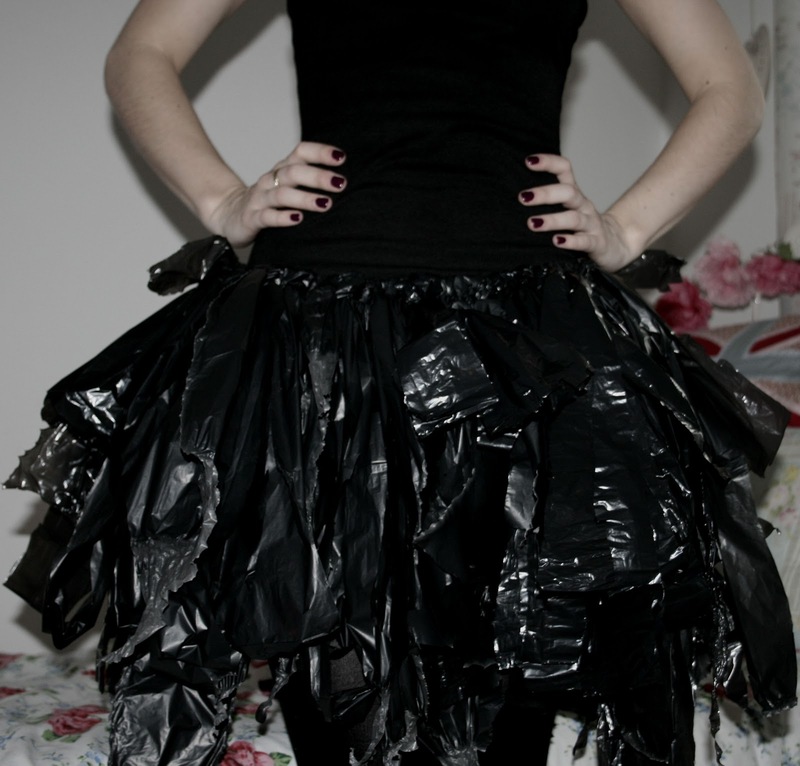 You could do it with white bin bags for a ballerina skirt, and maybe add some fake blood/red food colouring to zombie-fie it. 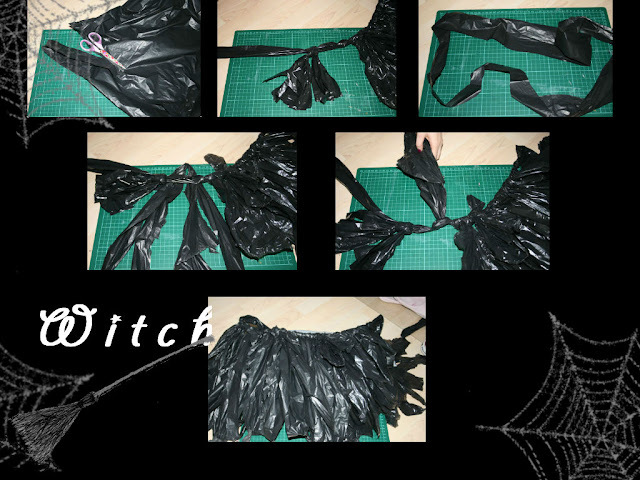 Also, if you make the black tutu above, but only fill the waist band with the strips to about half way, it makes a cool cape that looks like crazy bird feathers. x5 4m rolls of bandages - 1 for each limb + your torso. 1. Take your bandages and wrap them over your clothes in random criss crossing ways...The end? 2. Bandages are a bit more hard wearing than the good old toilet roll. I've used light cream and white bandages, and layered them up. 3. When your happy with the placement cut some holes in your tights/leggings, and you can do the same for your top so it looks old and moth eaten. (can moths even get in tombs?) Leaving bits hanging down, especially around the wrists looks cool. That's pretty much it for this one! But that's what you want right - something quick and simple? I'd class these as 'dispoable' costumes, as I doubt they would last more than one zombie rave. So, there's 2 (maybe even 5 at a stretch!) costumes you could try. I'm planning on wearing the mummy one for Halloween, and if I do I promise to post a photo! So yeah, basically whatever you feel like doing with you lovely locks that day will no doubt be on trend. Awesome. Although for the winter I think my ears may get a little chilly. Nonetheless, it keeps it up and out of the way and can be done easily in 2 mins! This picture, my friends, shows the little criminals that have forced me to pay for them, so they could make their way into my home, and hide away in my make up bag for a few months...But now it's judgement day. 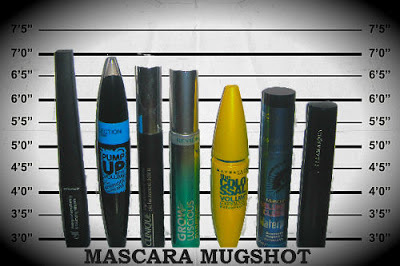 Now, you might notice that I'm a small fan of the old waterproof mascara. This is purely because I have oily lids, and anything else would cause me to look like a panda burglar, especially with high street products. I'm not really into wearing layers of mascara or the '3 lashes 1 eyeball' look, so anything low maintenance, that gives a natural appearance, with a little bit of volume is a winner for me. Elf Waterproof Lengthening & Volumizing £3.75 - Really natural looking, and stays put and incredibly cheap! Collection 200 (now just 'Collection') Plump Up The Volume Waterproof £4.99- The formula is a little too thick for me, and a definite no no on the bottom lashes. Hello panda. Clinique High Definition Lashes £16.00 - Love.Love.Love. Easy, even application that can be built up for a more dramatic look, and it stays *sings* All.Night.Loooong (all night, all night) Awesome. Revlon Grow Luscious Plumping Waterproof £9.99 - Nice and natural, gives a fanned out look, but I can't say my lashes grew/changed. Maybelline The Colossal Volum' Express Waterproof £7.19 - Liked it, but it was too heavy for my lashes, and flaked a little. Mine dried out quickly too. Also, what is that ' on the end of volume? Why not just put an 'E' there to spell the word? Bourjois Volume Clubbing Waterproof £7.99 - A bit full on for day, but great for night time smokey eyes, and it does.not.budge. Illamasqua Volume £15.00 - Nice and easy to work with, lots of volume, but it made my lashes look a bit stubby. Now, I know, I can hear you - The wands can be as important as the formula right? But I think that if your buying a product for the reasons it says on the tin, (even though that tin can have pretty much any claim it likes on it nowadays) then I feel it's kind of a package deal. Clinique is my No 1 favourite in this line up, with Elf a close 2nd and Revlon 3rd. All three can be easily built up for night time, but one coat for the day is natural, long lasting and doesn't smudge. I have been in love with the Cholé perfume since forever, so I was majorly excited when I found this dupe :]] ! I can't remember where I read about it sorry! 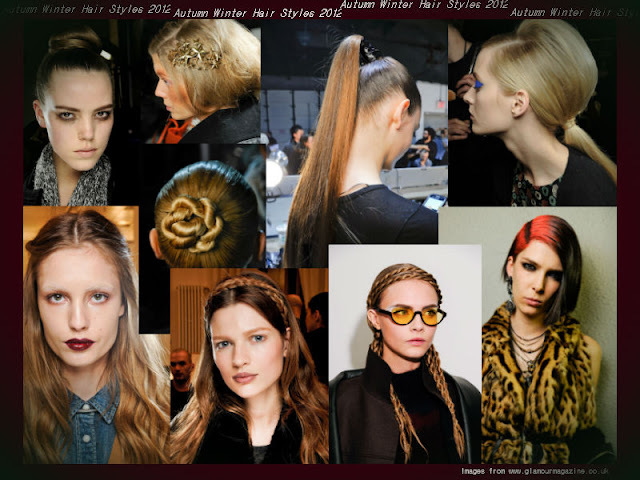 Somewhere in the blogisphere, but I was in Next the other day when I remembered this little nugget of information, so I went in search for this magical copycat. Also, with the Next version, they do all fancy house stuff in the 'London' scent! Yay! So you can make everything smell awesome. 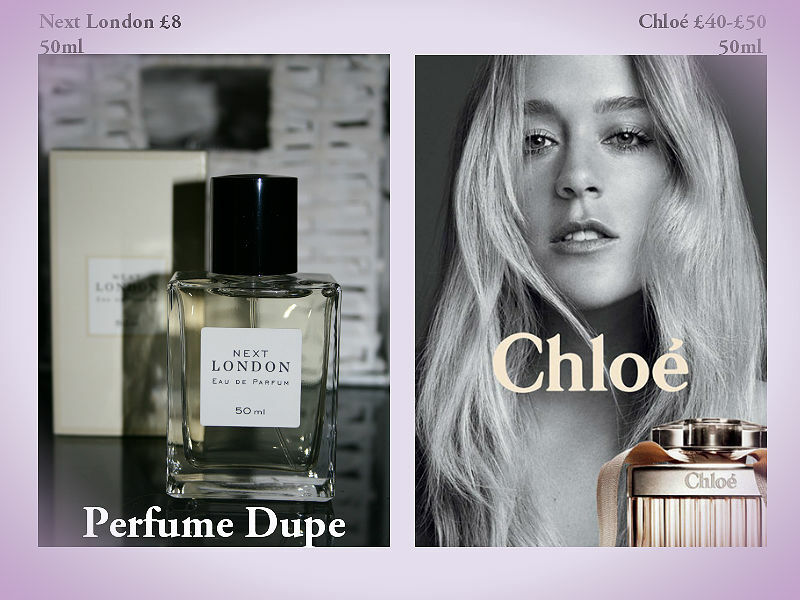 Next time your out and about, go and have a sniff of either or both! They're heavenly. STOPTOBER | For Non Smokers! Did you see the advert on TV? If you’re English and a smoker, go look – it’s here! Basically thousands of people across England are going to unite, and ‘keep calm’, and drink a lot more tea in order to stop smoking for the month! 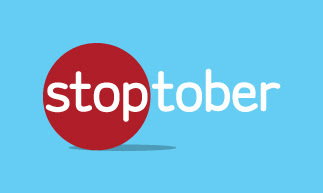 ‘Stoptober’ is a great campaign, at the end of it you could come out a non-smoker, with some extra money, better health and even a longer life, and also reduce passive smoking :] Can't really grumble at that. I don’t smoke, but I like the idea of quitting something, or a number of things for a month, to help myself and/or others. Plus, if I can handle a month, then I guess I'm less likely to continue the habit! I also really like the name. Healthy snacking between meals isn’t bad, but it's the nibbling away unnecessarily at the chocolate unhealthy stuff that is! Eat.Less.Junk. It's getting a bit silly and excessive, my wardrobe and draws are bursting. As much as the shiny, shiny, shoes tell me they need me, I will (sadly) leave them, all alone, un-purchased, and walk on by, in my old shoes. Hopefully (if I survive), come November I shall be healthier and a little bit richer. Hurray! P.s Hopefully this won't result in NO!vember, the month of regret.